Opening up a new start-up company is expensive, time consuming, and frustrating. Especially when searching for, and trying to set up affordable and appropriate office space. Coworking employs the sharing of office space with other like-minded individuals, in a cost effective and low rental commitment environment. The Costs of Opening Up A New Start-Up Company Office Average initial start-up cost items include: Rent & security deposit - often equaling 3 months’ rent, office furniture, computer hardware and software, setup, installation and consultation fees, business cards and stationery, decorating and remodeling costs, fixtures, counters, equipment & installation, starting inventory, raw materials, tools, deposits with public utilities, legal and other professional fees – Insurance, business licenses and permits, signage , initial advertising and promotions, not to mention operating cash for normal daily office expenses as well. All the costs above are mostly one-time expenses, recurring monthly costs are also going to add up as well, such as: Salary of an owner/manager - amount you need to pay yourself, employee salaries, wages, and commissions, payroll taxes or self-employment tax, equipment lease payments, more advertising - print, broadcast and Internet, postage and shipping costs, common office supplies such as - inks, toners, labels, paper goods, etc. telephone, utilities, Internet connection, website hosting bills, maintenance, monthly business insurance, and also business vehicle insurance, plus the monthly interest & principal payments on business loans and company credit cards, production costs - inventory, raw materials, plus more monthly legal and/or other professional fees, and any other miscellaneous mounting expenses that may come up, not to mention another month’s rent that’s due. This is not a cheap endeavor! Now think of how much money can be saved by taking some of the traditional start-up office costs out of the equation. This is why Cosharing or Coworking in an office space is catching on fast in the entrepreneur world, with a new mindset on business start-up costs setting in, and the conceptual definition of the “normal” workplace environment being modernly re-invented. Why Coworking Makes Sense Because of all the aforementioned costs stated above, Coworking is a great office rental option so as to keep overhead costs low and predictable each and every month. With the economy gaining strength after years of recession, the current pace of construction is still lower than it was before the 2008 crash, according to a Forbes Real-estate forecast that covered 2013 till last year. 2015 is not seeing any uplift either in the construction of new office, retail, or commercial space. 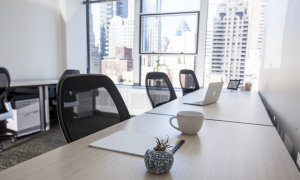 This trend will help to decrease the dwindling office space available now, as new business owners enter the market, while increasing the leasing costs for traditional office space in the future. The concept of Coworking in a shared office space appeals to many walks of business life. Telecommuters that work long distance jobs use Coworking, freelancers that find the working environment more stimulating and less lonely than a small home office use it, and of course, new start-up owners that need to run a new business cost affectively, have much less-to-loose when choosing to use Coworking office space. Cosharing workplaces like the one mentioned, normally provide private offices, coworking areas, and designated desk spots for an economical fee. Internet service is provided, and a laptop is a standard work day “bring along” item. Most sites offer conference rooms for use and communal receptionists, plus also guest lounge areas. One should be able to find some form of Coworking facility in any major city in the United States, due to the ever-growing popularity of the practice of Cosharing a working space. Coworking is being promoted as conducive to productivity by their proprietors, but not confined by it. The obvious benefits of renting short term, with low contractual obligations, easily promote themselves to tight budgeted start-up companies by providing them with a professional working atmosphere, in a casual but appropriate manner. This is why Coworking is ideal for many new start-up businesses in 2015 and beyond, hoping to cash in on a brighter new economic future.